The photobooth was really Jake's idea. I thought they sounded like fun, but I wasn't sure if we needed it or how it would work. He did the research, found a great company and booked it. He even made a logo for us to add to the bottom of the photobooth strips. What a man, I tell you. 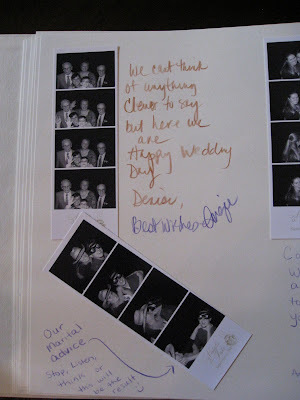 Our guests LOVED it and I have such a crush on my guestbook. The booth had an attendant who monitored the activity and printed the strips. Each group received two strips- one for them, one for our guestbook. The attendant made sure that they knew what to do. I bought a Kolo book from Paper Source along with an extra set of pages along with some colored pencils, a pencil sharpener, two rolls of double sided tape and an eraser. The photobooth was set up on one of the two balconys branching off of the main dining area, which meant gorgeous views of the city while you were waiting for your chance in the booth. It was also quite close to the candy bar. Party time! We added one of my favorite photos from Erin's wedding to the cover. You have to click on that image to really see the adorableness that is Jake's parents. We found these photobooth pictures while compiling the rehearsal dinner slideshow. His mom had written a note on the back with a few details about the photo. Unfortunately, the middle photo has been removed and is now missing, so we only know that it was in the 50's and that they were going to see a movie. Sigh, so darn cute! We brought some props, but only a few people used them. They all loved the colored pencils, though! Here are a few of my favorite pages. Click to enlarge and get the full effect. My bridesmaids made this work of art for me. Don't ask about the political stuff, lets just say that it was a theme at both the ceremony and the reception! The photobooth shots were taken after this lovely photo. The top set is of a few of my favorite relatives, including my Grampy. The bottom photo is kind of hilarious, with my cousin Mike and his new wife Jessica. I give a thumbs up to the very popular wedding photobooth. The images will give us the giggles for years to come. Very cute book, and great pictures! I don't really get sad about the "extras" that we won't get to have due to our budget, but the photo booth is one that I am definitely bummed about. They look like so much fun!! Okay - this has to be the best blog ever!! 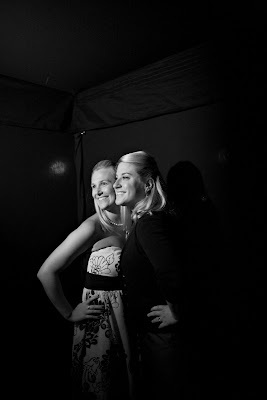 I love photo booth blogs - or at least posts about photo booths. 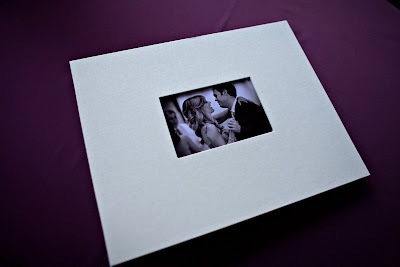 You did such a great job describing everything you loved, and the photos of your scrapbook are wonderful! 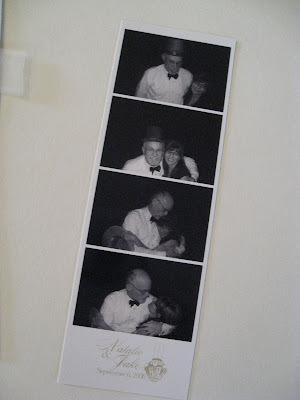 I tell my clients that they will love their memory album, and when they sit down together in 10 years to look over their wedding photos - they will laugh so hard it hurts b/c of these fabulous photo booth pics. 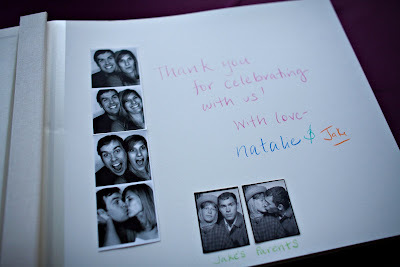 Congratulations on your wedding and keep telling people about the photo booth...the trend is starting to catch on!! Do you mind me asking how much it was for the photobooth? We are considering it and our wedding is next month...trying to figure out how to tack that on to the budget..Did you feel it was worth it? ?